WWW, December 2008 - After being selected to become the next president of the USA, Barack Obama's choice to have his inauguration religiously blessed into existence is more than significant. He got a warm welcome and an even warmer applause by the attendees of Rick Warren's "Saddleback Civil Forum": Barack Obama, the man who would later be selected to follow up George Bush in the White House. In Babylon's system of Church and State, there is a supposed "Separation". However, the Separation of Church and State does little more than signifying that Babylon's System is more than just a System of States, or System of Religions. The Queendom of Lucifer incorporates the Churches, the States, the Economy: literally everything that she created is used to keep people under slavery from the cradle to the grave. Christians who know that the Messiah spoke about His Kingdom being "Not Of This World", that "This World" refers to Babylon and her master, Lucifer or Satan. And so, those who are born again know themselves to be in Babylon, but not of Babylon. However, there are those who identify so much with Babylon that they simply take their place in the System of Church and State. 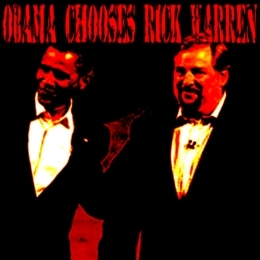 They are led by leaders such as Rick Warren. The CRC wrote extensively about this man, and how he aims to unify churches of all denominations into a global network which will install a "Global Peace". Warren's Saddleback Church takes her place in the System just fine, too. He has a "Saddleback Civil Forum", wherein he teaches his flock how to basically be good Babylonians and take position in the System. After all, it's theirs too, isn't it?